I have to laugh sometimes. 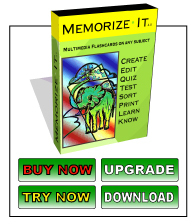 Long ago I created a Wikipedia page for Memorize-It. I did this mostly for a better Google rating, but also as a historical reference. I've been revisiting it recently as another company I do some advisory work for has been talking about adding a Wikipedia entry. I then went to look at the electronic flashcards entry on Wikipedia to see what software was listed. It seems that Wikipedia has removed all references to the different flashcards software. Which seems odd, but as much as I really love Wikipedia, their content rules for external links are quite schizophrenic. It doesn't bother me really, but then I started looking at the page history for edits to the electronic flashcards page (anyone can edit a Wikipedia page) to see when those references were removed. The edit history looks like a war zone where tons of people (mostly Supermemo) are desperate to have their link on that page. Wikipedia editors have been fairly quick to delete references to real electronic flashcards software (over and over and over again). I don't understand why Wikipedia doesn't want links to real electronic flashcard systems, but it is just interesting to see the attempts. Then I went and looked at the Wikipedia Memorize-It page and there were a ton of similar edits to competing products added and removed. I wouldn't mind them there since I still believe that Memorize-It is the best flashcard software, but then again the Wikipedia editors have been fairly diligent about removing those links as well. It should be noted that I did include a real link to a (very militant) competitor (Supermemo). Some may think it strange, but my goal in this venture is for people to learn with the method that is best for them. The more information you have in your decision making process, the better life will be for all of us. I don't always agree with the tactics some companies use, but I don't mind the competition at all. My suggestion to the Supermemo folks is to use a little larger font and a little more substance on their main page. My eyes went cross after about 20 seconds. Looking at their history, Supermemo has been around just as long as Memorize-It. The original DOS versions were both developed in 1987. Interesting. It has been a long road. I've never met or spoken to Piotr Wozniak, but I'm sure we could have an interesting conversation.